Oh my gosh. You guys. I've been dying to share this project with you for weeks. 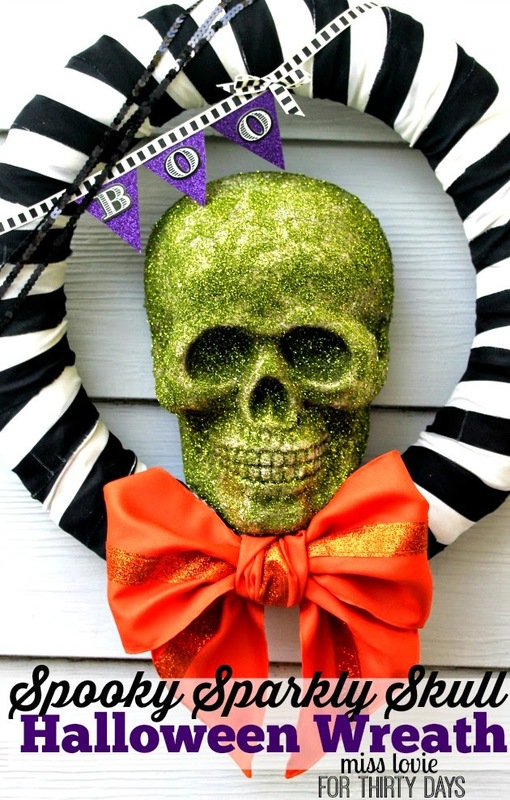 This Spooky Skull Halloween Wreath is probably one of my most favorite projects I've made in a long time! 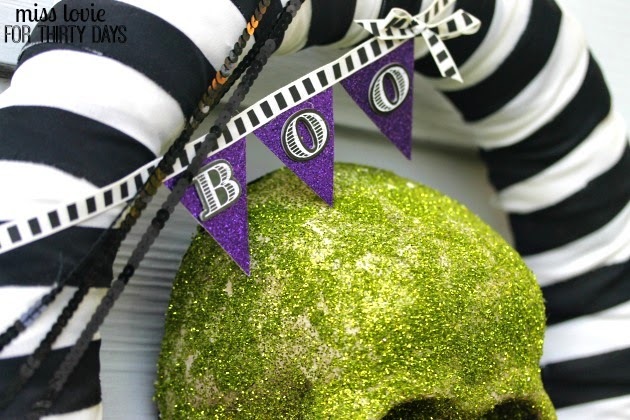 I love the colors, the glitter, the stripes, and the spooky, of course. 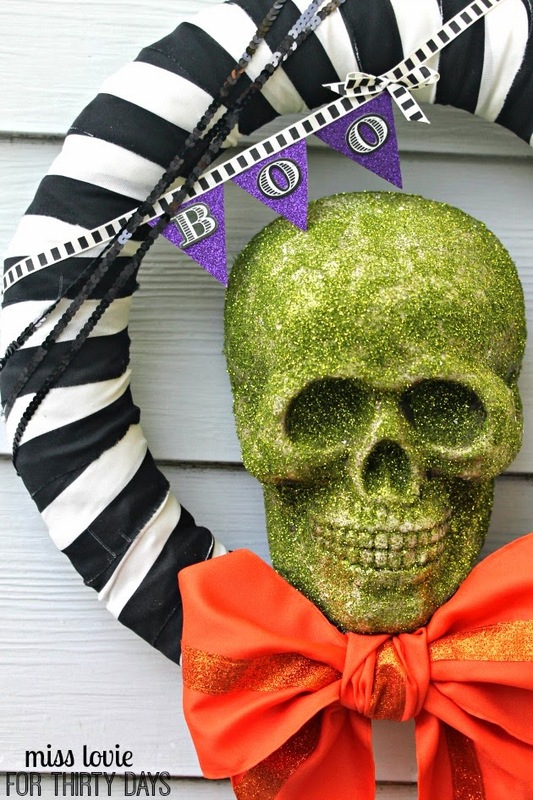 So much glittery Halloween-y goodness. If you want more pictures of this wreath and instructions on how to make it, go check out my tutorial on Thirty Handmade Days!! Anyway, it's inevitable that the beginning of school is coming and I know there are lots of teachers out there scrounging their brains for lots of new and exciting ideas, so I thought I'd share one of mine today. 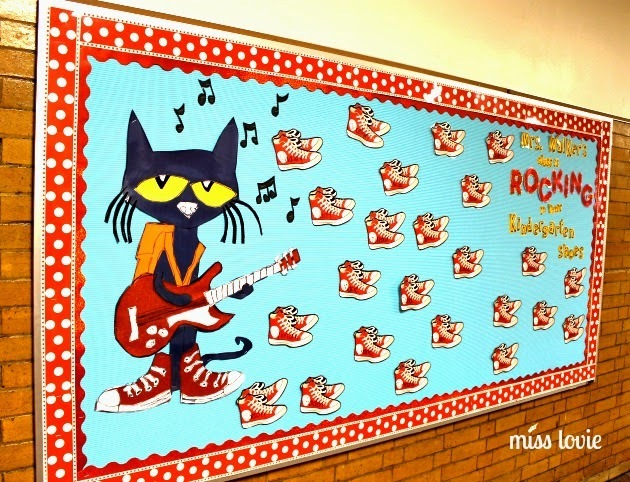 Last year I created this Pete the Cat Rocking in My School Shoes Back to School Bulletin Board (hello, mouthful) for the board outside our classroom. 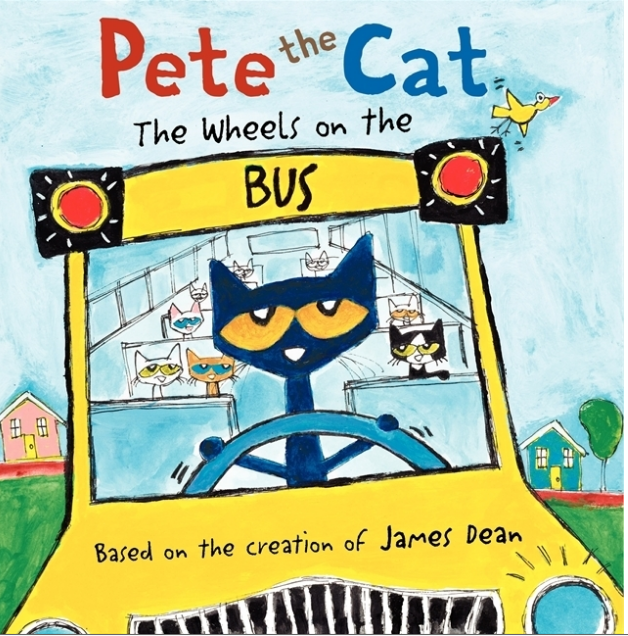 I am obsessed with the Pete the Cat books so it is always my ultimate goal to pass that love for this fun character to my students. It usually just takes one reading of a couple of his books to do just that. Rocking in My School Shoes, I Love My White Shoes, My Four Groovy Buttons, Wheels on the Bus are my beginning of the school year favorites! So for my back to school bulletin board I usually go with some sort of theme and put all the kids' names on it to make them feel welcome. I always let the kids take home their name as well, which they love. 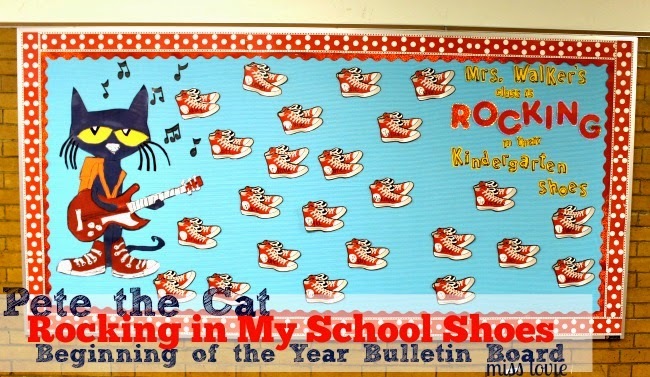 I am fully aware that a Pete the Cat Bulletin Board is not a super novel idea. When searching Pinterest, I found it here, here, here and here, but I still wanted to show you my process. 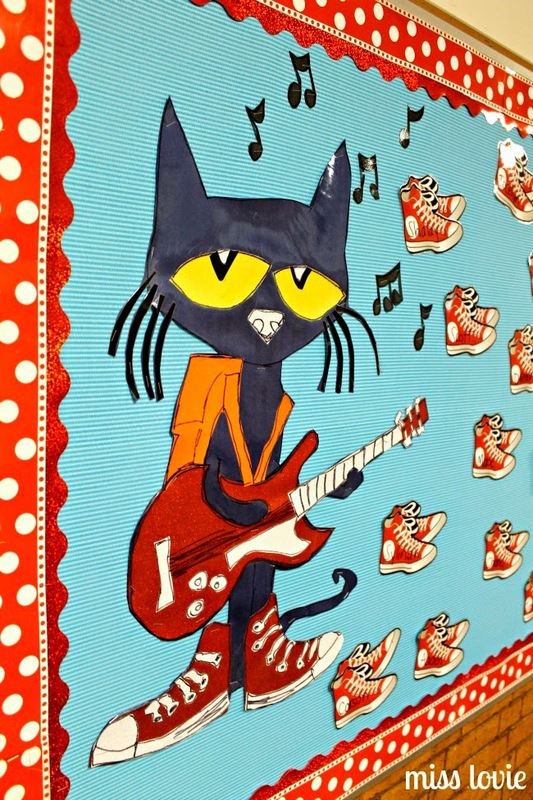 Since I wanted to go with a Pete the Cat, I had to figure out how to make most of the things I needed since they don't sell Pete the Cat Bulletin Board Kits at the Parent Teacher School Supply Store (and who can afford that anyway?!). I had almost started to make my own shoes when I found the PERFECT ones at JoAnn's in their teacher section. Huge score. I don't have a really great step by step picture tutorial for you today to show you how I made the rest of the board and Pete, but I'll explain it the best I can. Ok, now the best part of this bulletin board is the Pete. I'm not going to lie. This took some time. Of course, I always take forever deciding how I want to do my board so I could have definitely been making better use of my limited time right before school, but to me, this was pretty important, so whatever. :) If you want to do something like this, don't be like me- make up your mind earlier and get things done ahead of time so you can do other things you really need to do (and also get at least a little sleep before the first day of school). 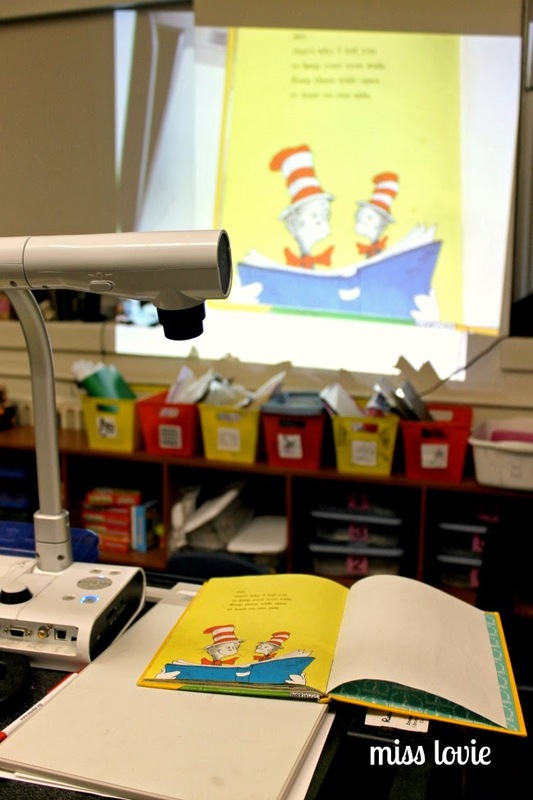 So basically for large characters, I always project the image with a document camera (we have ELMOs at our school) and trace the image onto whichever color paper is needed for each part of the character like I did here for a different character below. I don't have pictures for how I did Pete, but I will explain it and then you can see more details in this post for my Dr. Seuss Door decoration. 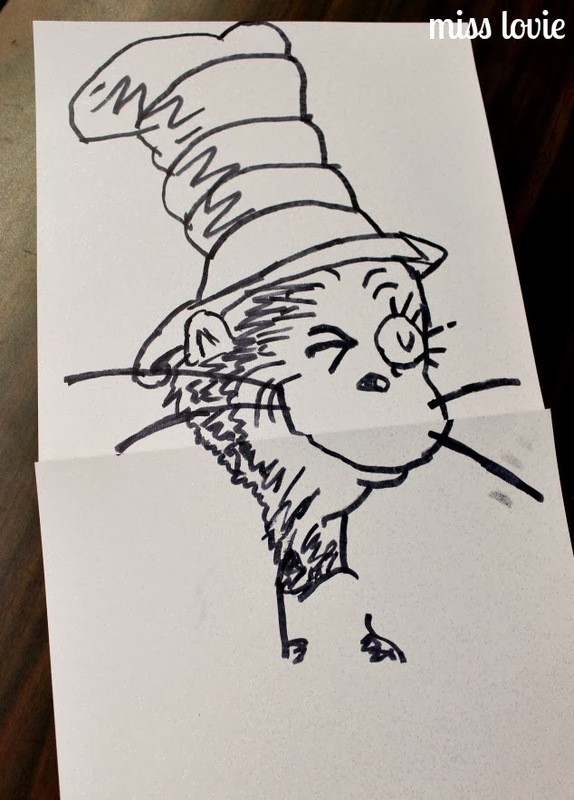 So as you can see from the example above, take the color construction paper or scrapbook paper that is the base of the character, for The Cat in the Hat, it was white (and I used sparkly white scrapbook paper taped together! 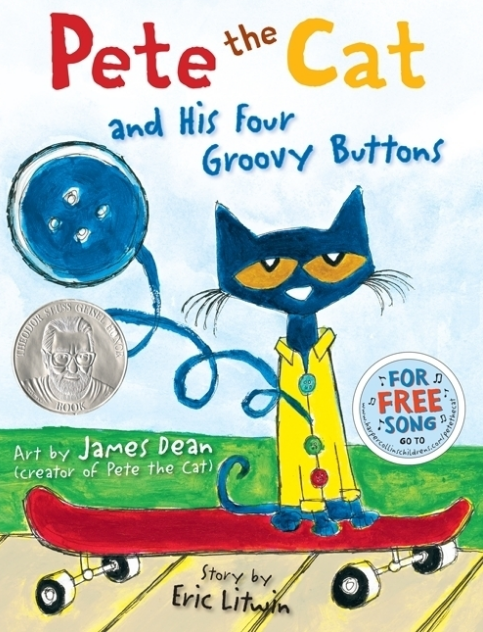 ), but for Pete the Cat, I used navy blue. I actually used navy blue bulletin board paper for this because it was already huge and the right color. 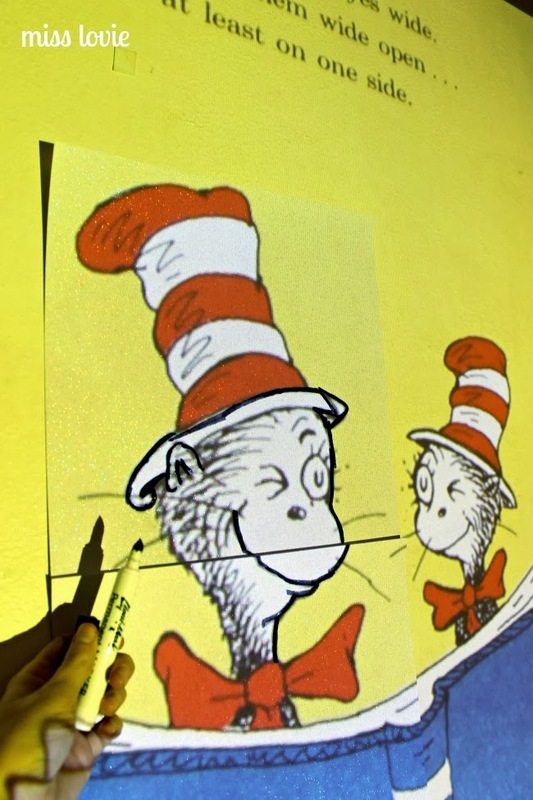 Tape the paper to the wall and trace the entire base of the character with a permanent marker. 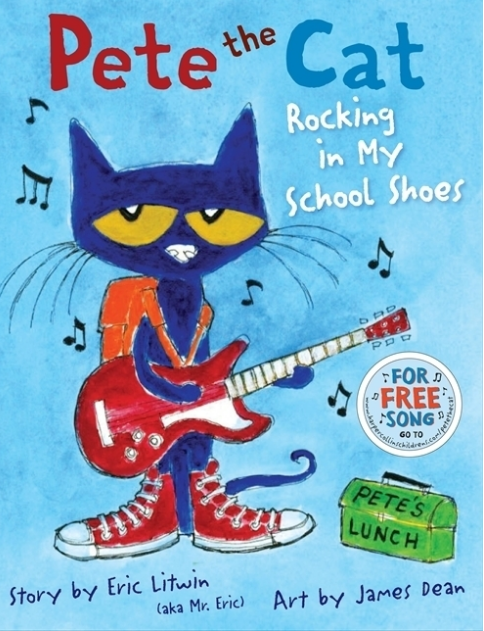 I just traced Pete's body, including the backpack, the red body of the guitar, and his legs onto the blue paper, not the white part of the guitar, shoes, or whiskers. These parts can be glued on later. Be sure to add in all the details as you trace on the parts that will be that color. For Pete, I didn't need to trace the details of the backpack, guitar or face because I would be gluing on different colors for those items. Then take the base down and set aside. Then tape the color for the next item, his back pack- so I used orange construction paper and traced it with permanent marker, cut out all the parts, and then glued it with elmer's stick glue on top of the blue base of Pete. See below for how I did it on Cat in the Hat. The process is the same. Continue this process with all parts of Pete. 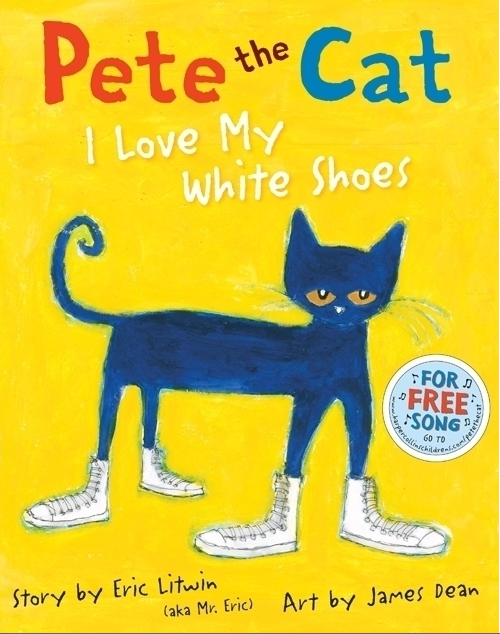 I did use the sparkly red and white scrapbook paper for Pete's guitar and shoes to add more pizazz :) Be sure to add plenty of detail on the white parts on the guitar and shoes with your permanent marker to make it look realistic. Glue all the parts where they go onto the Pete base. 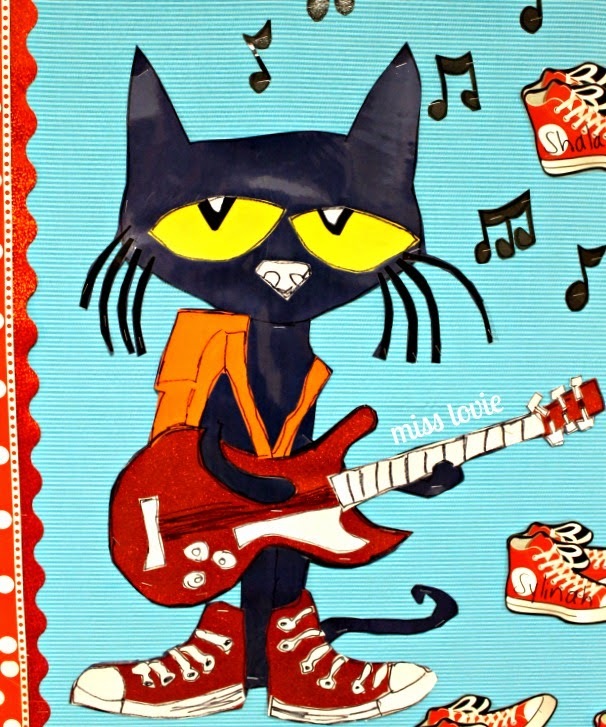 For the whiskers, just trace and cut out curved lines from black construction paper and glue the ends to Pete's face. Then run it through the laminator to make sure all parts stay together nicely and you can use it again! Be sure that all your parts are glued on sufficiently so they don't slide during lamination like one of Pete's shoes did!! I did leave the white arm of the guitar off when I laminated Pete and laminated it separately since it since it wouldn't all fit through the laminator. Then I taped it on with clear tape- no big deal. Cut out the laminate around Pete and you're done! Whew. 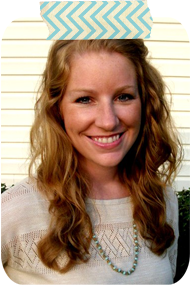 I told you it was a little time consuming, but to me, well-worth it! 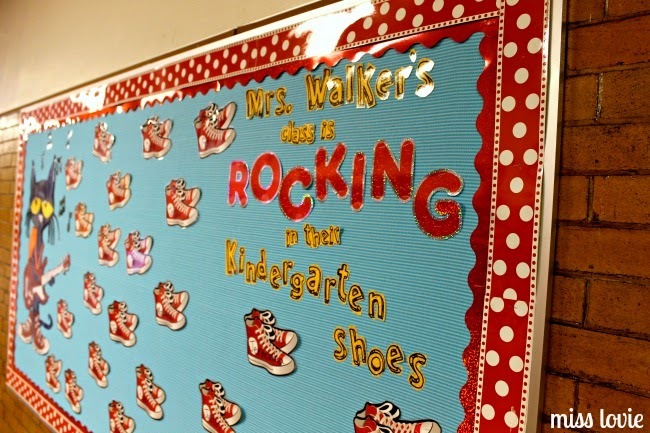 I'd love to hear about your Back to School Bulletin Board this year! Leave any links in the comments and I'll come check you out! 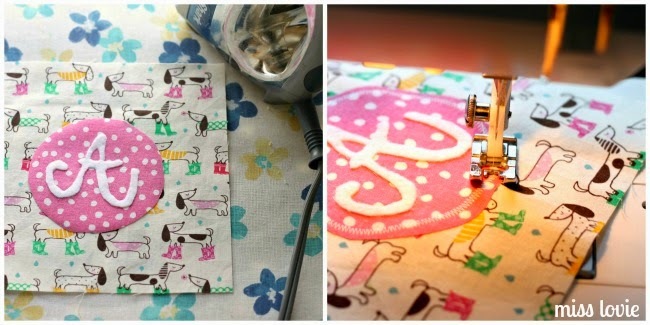 Today I'm over at Thirty Handmade Days sharing my Handmade Monogram Stationery! 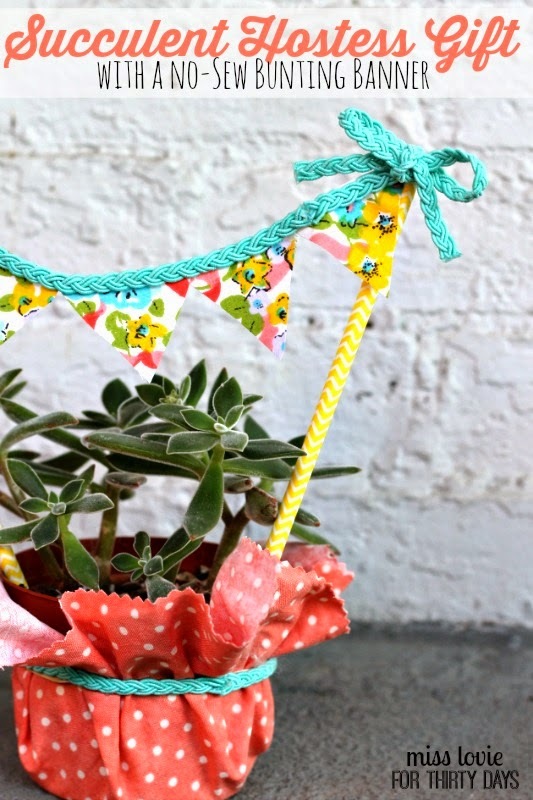 This is a great scrap-busting project you could make in an afternoon for yourself or a friend. I love cute and unique stationary and you can always use more. Plus, it's super cheap because you probably already have all the materials you need on hand! Bonus! 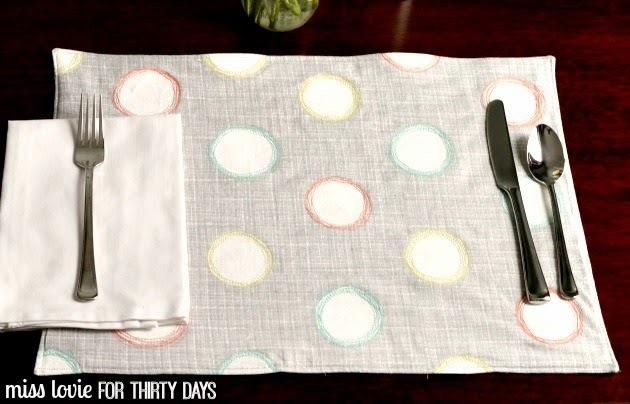 Head on over to Thirty Days for the tutorial! 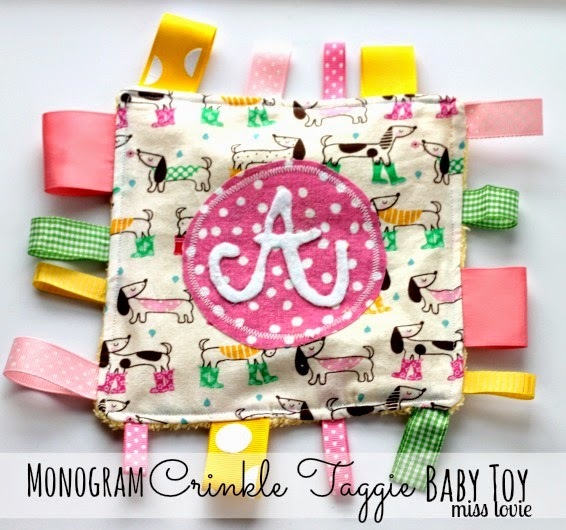 Today I'm sharing this super easy and perfect baby gift, the Monogram Crinkle Taggie Baby Toy. I made one of these for my niece and blogged about it here, but didn't write a tutorial for it. This time when I made a couple for friends who had new babies, I snapped a few pictures along the way. 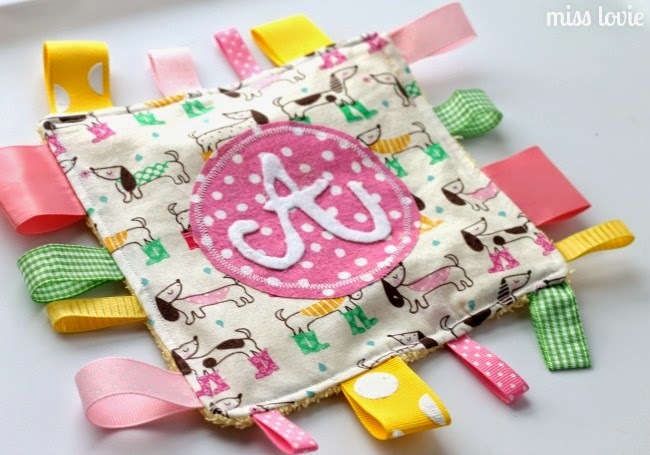 There are a lot of tutorials for these out there, but I loved the idea of adding a monogram to the toy. 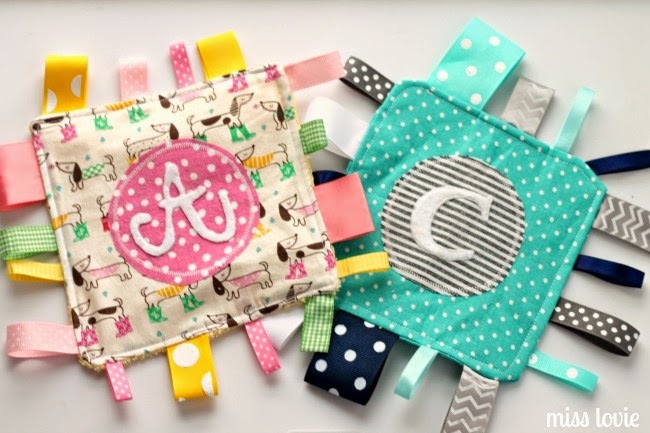 Handmade gifts are already so special, but anything with the baby's first initial or their name makes it that much more special. I knew my friends would love these toys for their new babies. These toys are baby gold. They make noise and the tags hold the attention of those tiny tiny fingers, and of course mouths. Ha. And the best part? 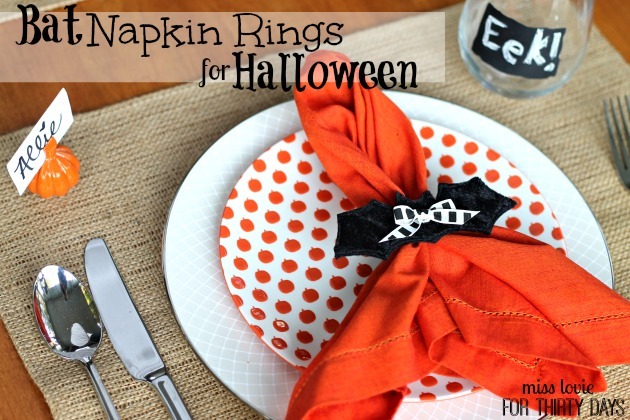 They are easy to make and pretty inexpensive! 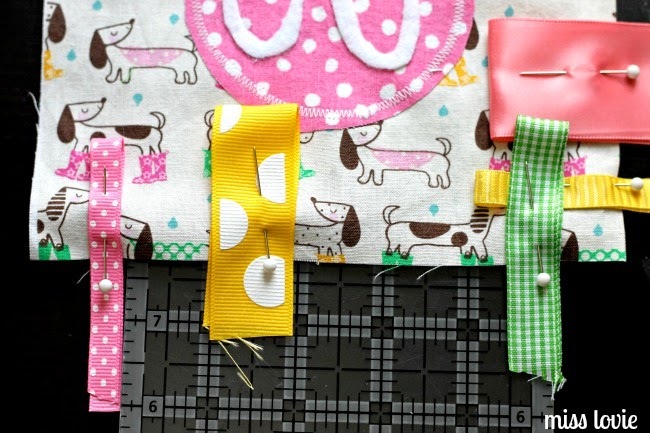 Coordinating fabrics for the front of the toy- if you have scraps, you may be able to make those work! If you are really good and can cut letters free-hand, go for it. I usually can do okay, but I wanted something fancy for a little girl so I printed this letter and cut it out to trace onto the fabric. 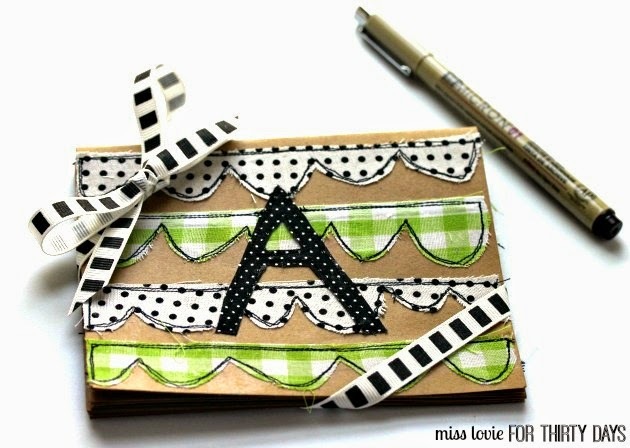 Use a water soluble fabric pen, trace the letter onto the felt and use your fabric scissors to cut it out. 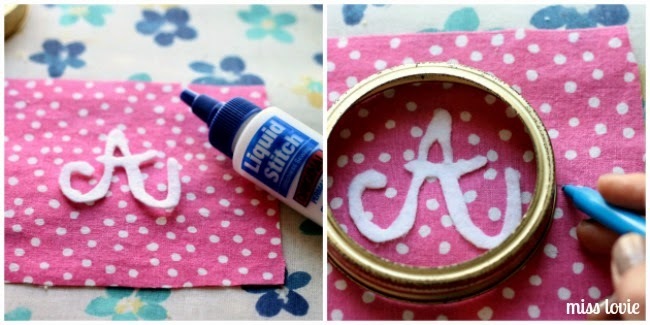 Use the fabric glue to glue the letter to the fabric you're using for the circle. 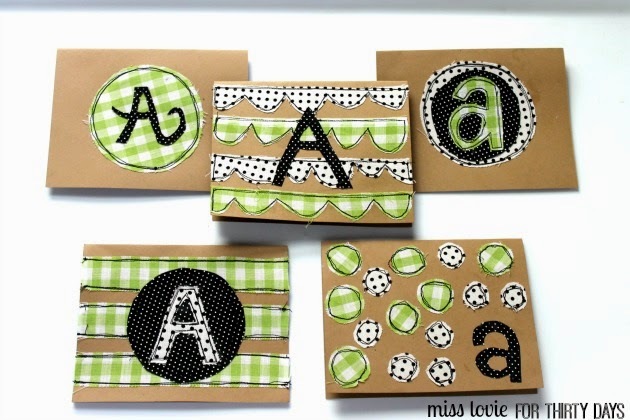 Use a water soluble pen to trace a circle around the letter, ensuring it is in the center. Cut out the fabric. Iron on a matching circle of ____ then peel off the paper backing. 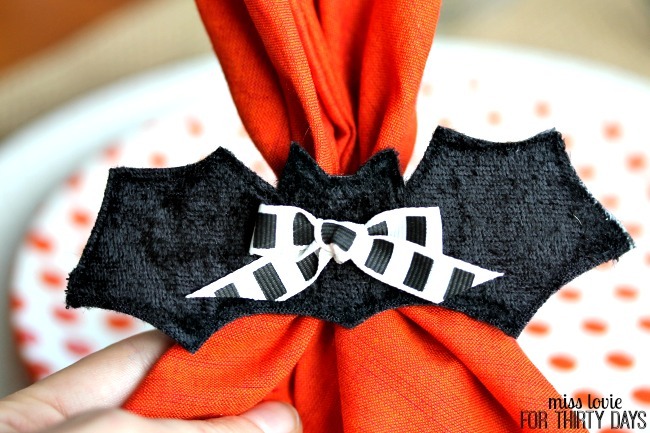 Iron the circle onto the front square of fabric, then zig zag stitch around the circle with a 2/8 inch seam allowance. 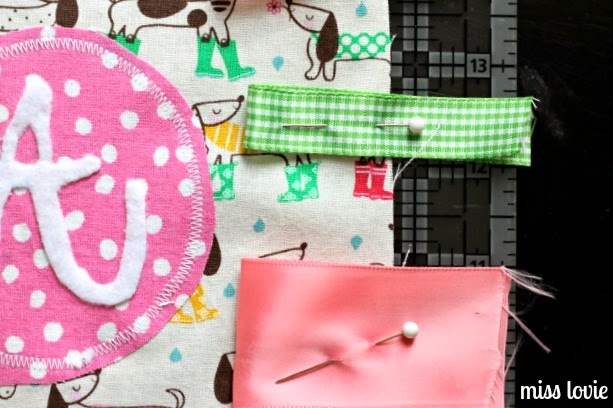 If you want to stitch around the letter, do that now. I didn't with this letter because I forgot mostly, but I did on the other toy I made with the C on it. 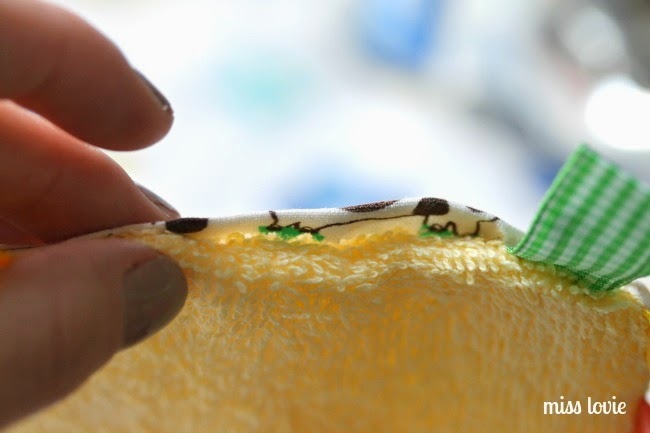 It won't matter if you don't stitch it because the glue will keep the letter on, but it will make it look professional if you do this step (and don't forget like I did!). Now let's finish this toy. 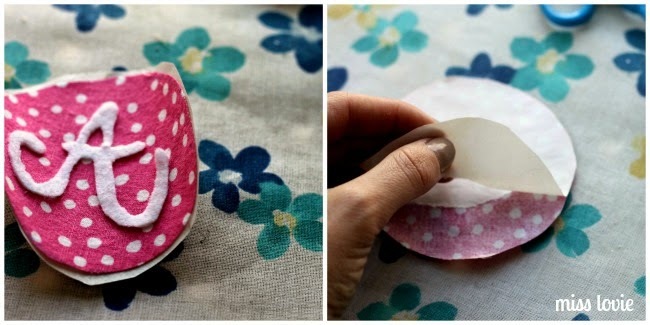 Fold them in half and pin them with the fold facing toward the middle of the square about an inch apart. 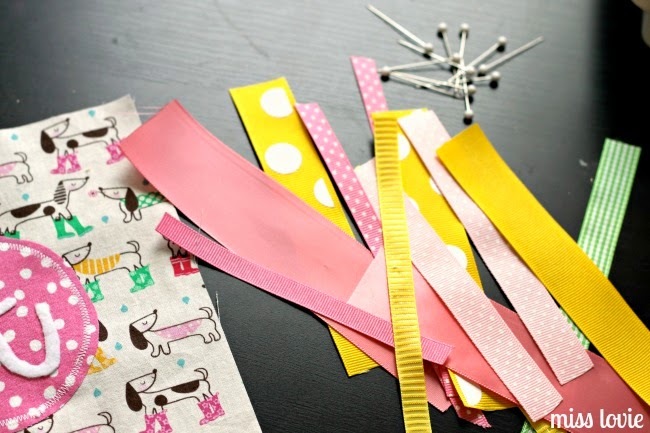 Remember that the seam allowance will cut off about a 1/2 inch of the ribbon so be sure that you have the amount of the ribbon you want towards the middle. 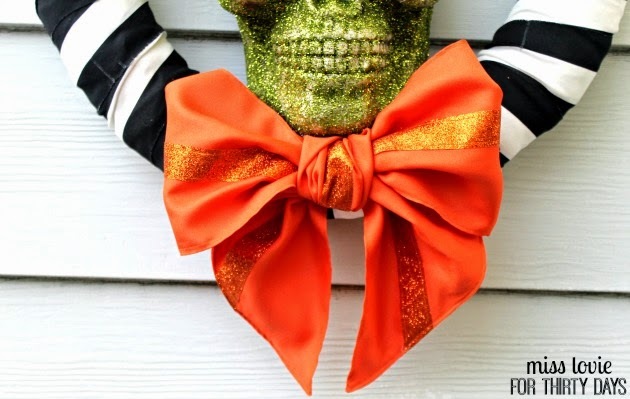 On one edge, space your ribbons about 2 1/2 inches apart. 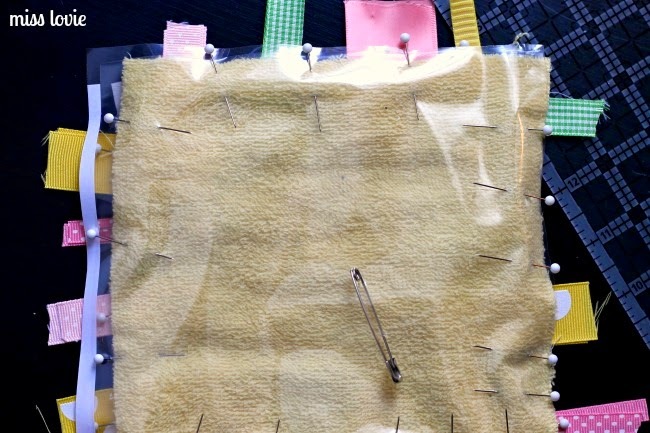 this will be where you turn the fabric inside out once you sew it. It may look a little weird, but once it gets all finished, you won't even notice. Next layer on top the back square of fabric right side facing the right side of the top square and then your square of noise making plastic on top. Safety pin the layers in the middle of the square. Pin around the edges well. Sew around the edge with a 1/2 inch seam allowance, removing pins as you go, stopping before you get to the larger gap between the ribbons. Don't forget to backstitch. Turn your toy inside out and poke out the corners with a blunt pencil or a similar tool. 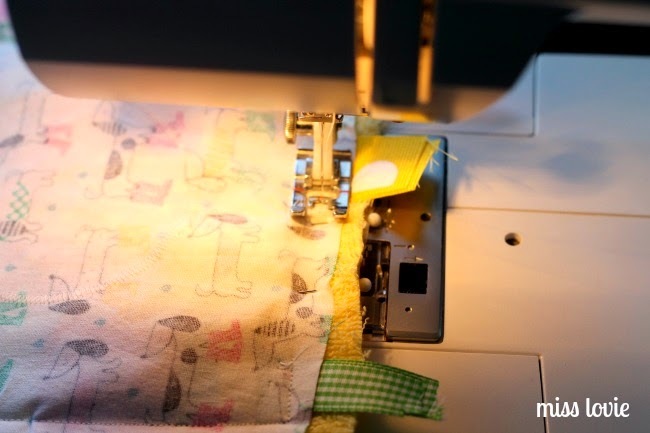 On the opening fold the fabric inward to match the rest of the fabric, press with an iron, and use a whipstitch to hand sew the opening closed. 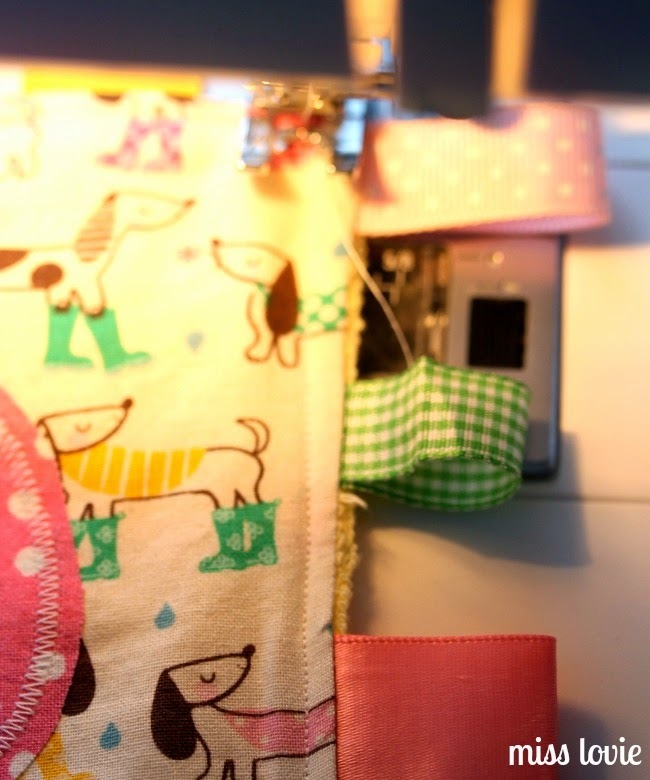 Press both sides of the toy, then top stitch around the edge of the fabric with a 3/8 inch seam allowance. I usually just keep my eye on the foot and be sure it is in line with the edge of the toy. 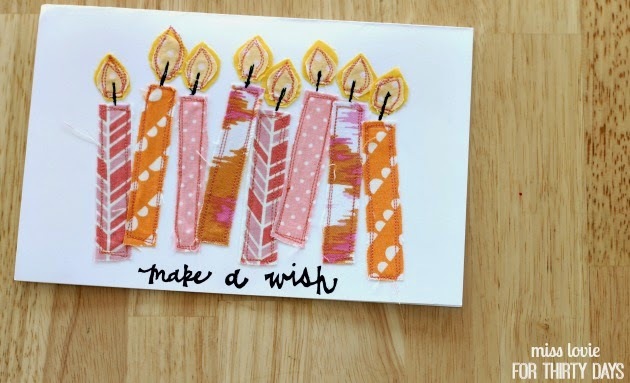 These are so easy and cute. Any baby would love them. In the picture above, you can see a few of my ribbons got skewed a little while sewing so they aren't completely straight. You'll want to prevent that as much as possible, but if you can't it's not a huge deal. 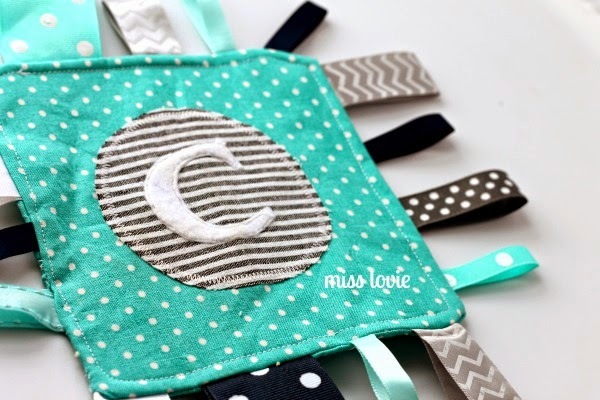 Soft, brightly colored, noisy, personalized, and ready for baby!! 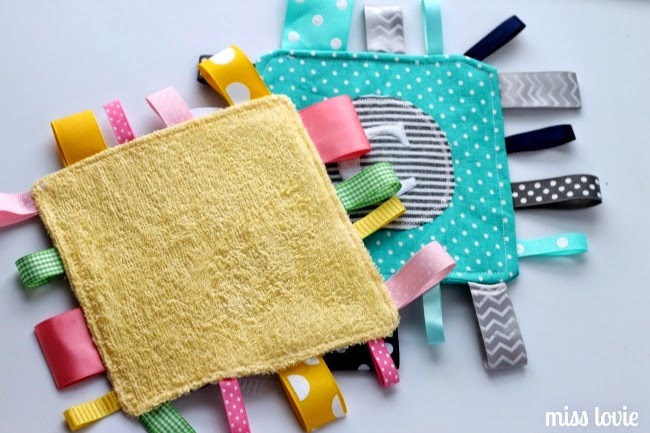 If you loved this idea for baby, be sure to check out my tips on making a Faux Chenille Baby Blanket, and this tutorial on a really easy Easter Flower Onesie Dress! 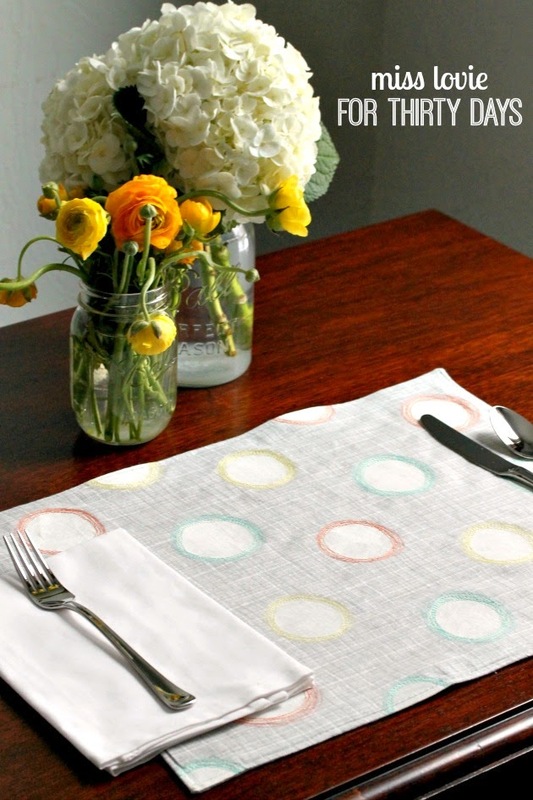 And for more simple sewing projects, You'll want to check out this Easy DIY Backyard Hammock, these reverse applique Fabric Heart Coasters, and these Sketchy Dot Placemats. Hello friends! 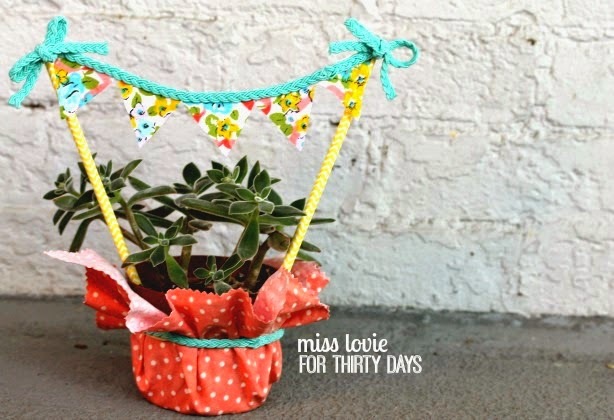 Today I'm over at Thirty Handmade Days with this super easy tutorial on a Succulent Hostess Gift with a No-Sew Banner! 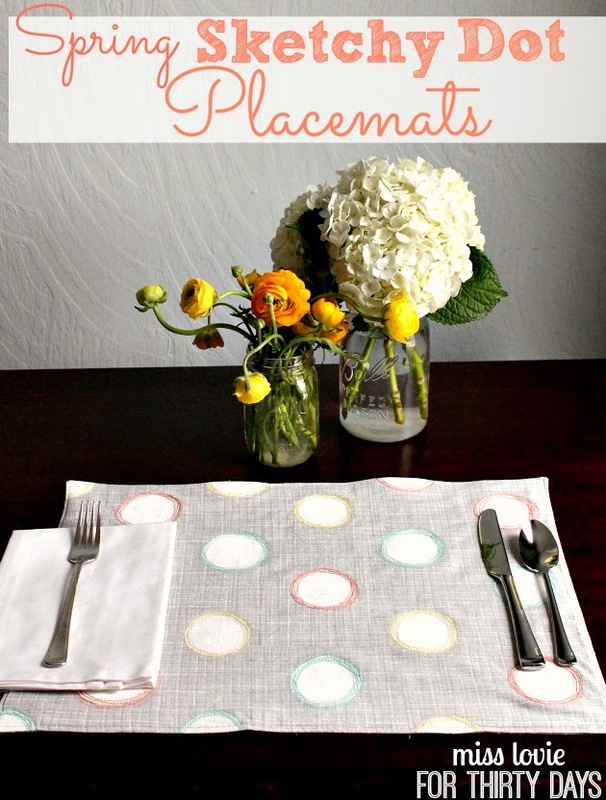 This is the perfect quick and easy hostess, housewarming, whatever-you-need gift that can be easily thrown together in less than an hour. Go check it out!! 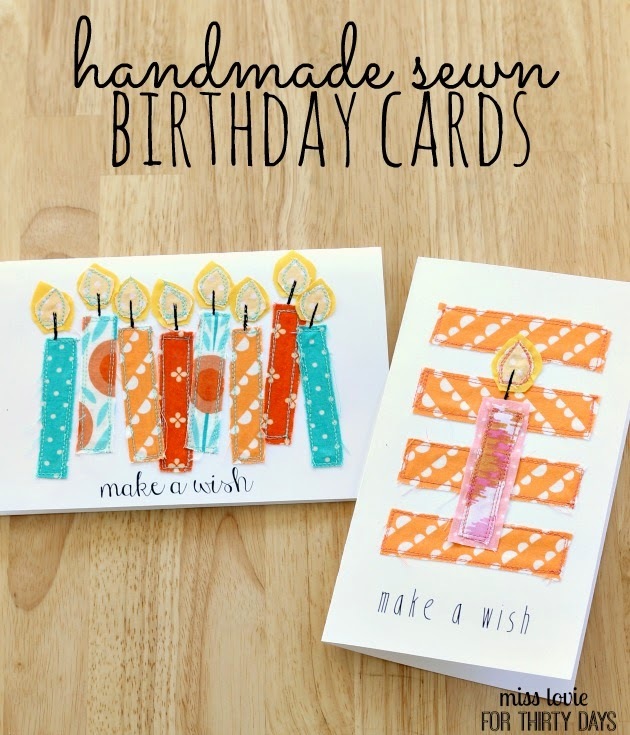 Today I'm sharing my Handmade Sewn Birthday Cards with free printables on Thirty Handmade Days! 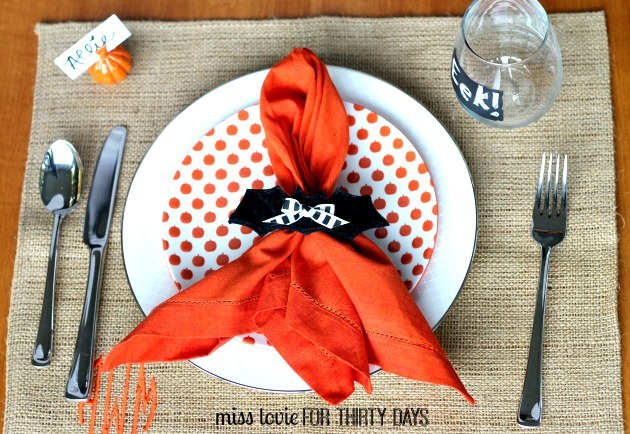 These turned out so super cute and are very cheap and pretty easy. Be sure to head on over and get the full to tutorial!